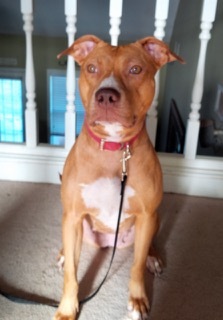 2-3 yr old red nose female, vet checked, up-to-date on all shots and screenings, spayed, treated for heartworms, heartworm negative and on preventative. All medical treatment receipts available. Very intelligent, loving, loves to snuggle, laid back with occasional burst of energy, so needs someone willing to exercise and play with her, house trained to the extent that she lets you know when she wants out, somewhat kennel trained, takes correction easily, no prong or e-collar, absolutely loves treats, learns quickly, leary of strangers especially those with any tension/nervousness but will warm up to them once they calm down and especially if they give her treats, would be best in a home where she is the only dog/animal.